English 18th-century red morocco, lettered: Life of Christ, in blue morocco case. Purchased by J. Pierpont Morgan (1837-1913), before 1913. 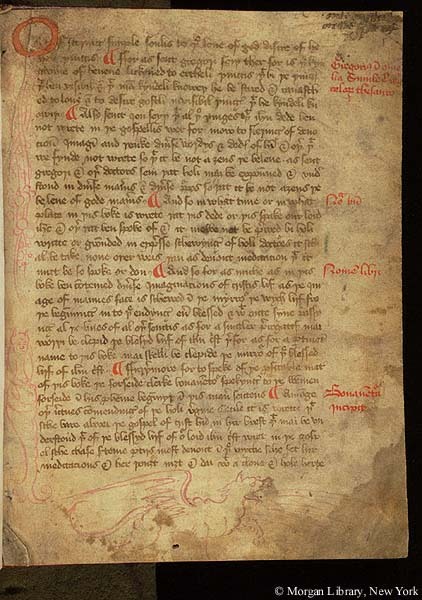 George Richard Rogers (15th century, fol. 28) and Katherine Byrley (15th century, fol. 78v); Nathan Redgrave of Framingham, Suffolk (16th century); bought in 1752 for £10.10.6 by Ebenezer Mussell; his sale (London, May 30, 1766, probably no. 80 or 97); Sir John Fenn (not in Frere sales of July 16, 1866, Feb. 14, 1896 or Dec. 2, 1907); Pearson; purchased by J. Pierpont Morgan (1837-1913) from Pearson ?, before 1913; J.P. Morgan (1867-1943). Written and decorated in England, ca. 1450. Decoration: 2 pen and ink sketches in lower margins of fol. 1 (a mermaid and a winged quadruped).